Fred Fenster will be recognized for his accomplishments as a metalsmith artist, his influential role as teacher and educator, and his long association with SNAG as a Founding Member at this year’s SNAG conference in Boston. “What if…?” It’s hard to believe that this simple sentence is the root of a rich career that spans over 50 years but it is the question that has driven Fred Fenster’s studio practice because of its infinite possibilities. It is the question that he asks himself at the onset of each Kiddush cup, pitcher, teapot, or salt and peppershaker set. 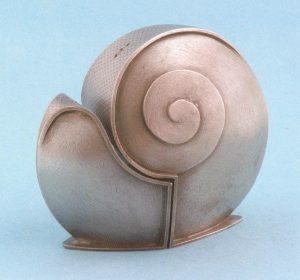 Known for his pewter and silver hollowware vessels, Fred’s aesthetic can be found in clean lines and intricately fabricated forms that honor the function of the pieces being made. Wine takes on the shape of a Star of David inside his signature Kiddush cup while the simple cut line of a domed form fits perfectly in the hand while it shakes out some salt or pepper for a meal. Fred has never tired in his dedication to creating pieces that integrate into our lives and rituals. Each piece contains a striking combination of simplicity and ingenuity requiring Fred to alter or design new tools and stakes to execute his designs. Fred Fenster’s research and creative work with pewter has garnered attention not only in the U.S. but also abroad in countries such as Korea and Taiwan. Artists working with this material today either directly studied with Fred or were taught by his students. He is responsible for bringing this out-of-favor material back into studios, workshops, and schools across the country. Born in 1934 in the Bronx, New York, Fred Fenster attended City College of New York before receiving his MFA from Cranbrook Academy of Art (Bloomfield Hills, MI) in 1960. In 1962 he was hired to teach design, jewelry and metalsmithing at the University of Wisconsin-Madison and began a distinguished teaching career, which lasted for more than 40 years. In 2005 he retired from the University of Wisconsin and was designated Professor Emeritus. Fred created a lasting network and legacy of professors, teachers, and artists all over the country. His success is evident in numerous awards including the Hans Christiansen Memorial Silversmithing Award; the 2004 Renwick Alliance Award for Excellence in Teaching; the 2006 American Craft Council Gold Medal; and in 2011 he was designated Master Metalsmith by the Metal Museum in Memphis, Tennessee. Fred’s work can be found in the permanent collections of the Renwick Gallery, of the National Museum of American Art, Smithsonian Institution, Washington, DC; Yale University Art Museum, New Haven, CT; the Detroit Art Museum, Detroit, MI; and the National Museum of Contemporary Art, Seoul, South Korea. Fred Fenster lives and works in Sun Prairie, WI where he is still busy searching for the answer to that simple question. SNAG’s Lifetime Achievement Award is the highest honor the Society can bestow upon an individual. This prestigious honor is reserved for leaders who have made significant contributions to contemporary metalsmithing throughout their career. Please join the SNAG Board of Directors at this year’s Boston conference to honor Fred!